Silver bars and rounds represent some of the simplest ways to purchase physical silver because they usually hold a value that’s extremely close to the spot value of silver. They are minted by private firms (as opposed to government mints) and often have a high degree of fineness. Silver rounds differentiate from silver coins because they are produced by private corporations rather than by government mints. They often come at a lower premium than their government-issued alternative, making them an attractive choice for some. Additionally, rounds do not carry a currency denomination as government-issued coins do, and typically do not have a date. 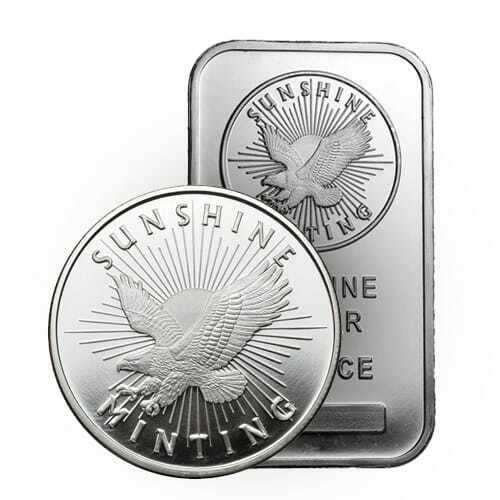 Akin to silver rounds, silver bars are also produced and marked by private mints. Bars are usually compact, stackable and easily storable. They are usually available in a number of sizes, such as one ounce, 5 ounces, 10 ounces and 100 ounce. Any silver bars or rounds with a minimum fineness of 0.999 are eligible for placement in a Precious Metals IRA. To learn more about silver bars and rounds please call us at (800)355-2116.